The 2010 Travel Guide features 312 “Best of New England — Editors’ Choice” selections, which include the best restaurants, lodgings, attractions, local secrets, and bargains in the region. 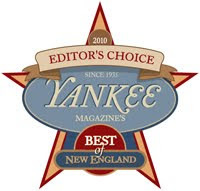 Yankee tells readers where to find the “Best Taste of Europe” in Maine, the “Best Music Hall” in Connecticut, the “Best Rainy-Day Excursion” in Rhode Island, the “Best Inn for Foodies” in Massachusetts, the “Best Sushi” in Boston, the “Best Art Fix” in New Hampshire, the “Best Aquarium” in Vermont, and many more. This special issue also names 120 top events around the region, plus 50 waterfront dining recommendations; food and home articles are also featured. Gale River Motel will also be recommended on YankeeMagazine.com.